Here's a new title from Australian author, Tania McCartney. It's the third in a series of children's picture books about Riley, and titled: Riley and the Curious Koala, A journey around Sydney. The first two were Riley and the Sleeping Dragon, and Riley and the Dancing Lion (my review). In this latest adventure, we see Riley zooming around Sydney in his little red plane in search of a koala, a most curious creature indeed. Riley is accompanied by the characters we met in the earlier books, Panda, Dragon and Lion. I loved that McCartney has chosen my hometown as the setting for this book, and enjoyed recognizing Sydney scenes during Riley's quest. All of the Riley books use real places and photographs. Kids get a taste of an authentic setting, and a dollop of reality in their fiction. I'm sure some kids who are world travellers will enjoy recognizing places they've been, while for others, the books will help them understand a little about other people's lives. In Riley and the Curious Koala, McCartney has kept to the successful formula of stunning black and white photographs as the backdrop for Kieron Pratt's illustrations. 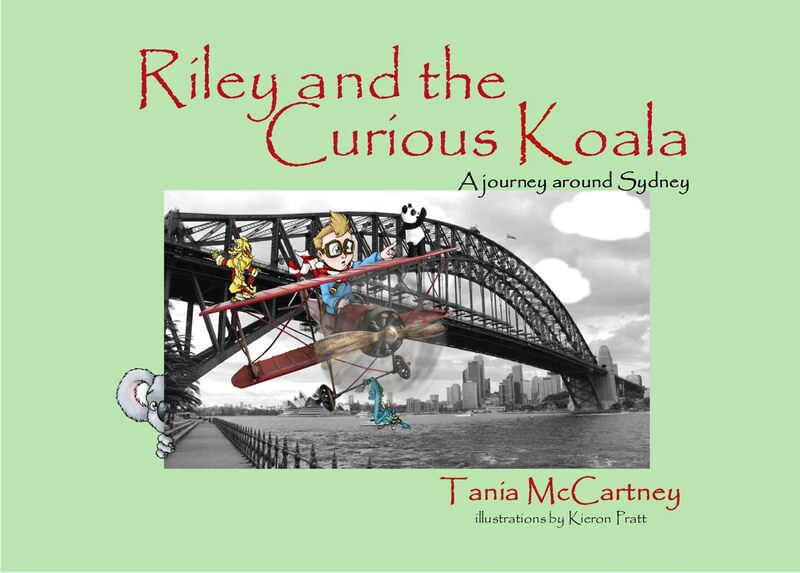 Riley and the Curious Koala would make an excellent choice as a gift for a child who lives in another country, especially one who's about to visit Australia. It introduces kids to the sights of Sydney and to many native Australian, as well as exotic animals. This also makes it a good choice for schools doing units on Australia. The Riley books help kids to see how accessible book-making is, and encourage them to give it a try themselves. Riley and the Curious Koala is an excellent model for kids to innovate on, using their own photography and art work, and creating a story to accompany it. Yesterday on The Book Chook, Tania McCartney discussed how to craft a picture book with photos, explaining techniques she uses in workshops with kids. That post was part of Tania's blog tour for Riley and the Curious Koala which you can find out more about at Tania's website. It's fiction, definitely, but with a real world setting. Is there a kidlitosphere meme for hybrids?